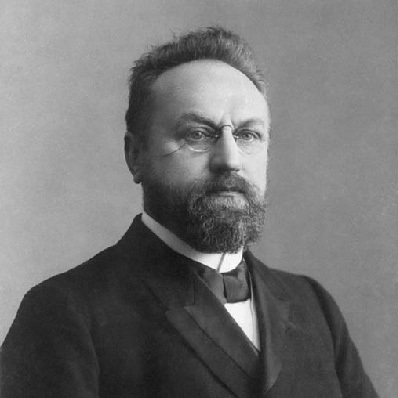 In its original form, Herman Bavinck's bibliography on the NRI site was prepared based on several printed and digital resources. Currently it has 831 items and is dynamically expanding. The bibliography does not contain resources that in several bibliographies were mistakenly attributed to Bavinck. A list of such resources can be found here. The bibliography has an intuitive interface and is easy to work with. Some of its characteristics, however, do require some clarification, which is provided below. In order to visually demonstrate the interrelation between different editions and translations of a volume, the bibliography uses a tree-view representation. The idea behind it can be explained using the second volume of the second edition of Bavinck’s Gereformeerde Dogmatiek. This screenshot displays first the bibliographical item itself (in a larger font) and, under it, other items (in a smaller font) with which the main item is connected. These items are called "subitems." The first subitem points “back” to the first edition of the second volume. Hence the arrow at the beginning of the line points left. The rest of subitems point right, because they “derive” (directly or indirectly) from the main item (that is, from the second edition). The second and third subitems are the third and fourth editions. They directly “derive” from the second edition. The fifth, sixth, and seventh editions, however, use the pagination of the fourth edition. Therefore they directly “derive” from the fourth edition and, consequently, are displayed under the fourth edition and with the offset on the left side. The next point is William Hendriksen’s translation. It directly “derives” from the second Dutch edition. Several reprints of this translation are placed under it. 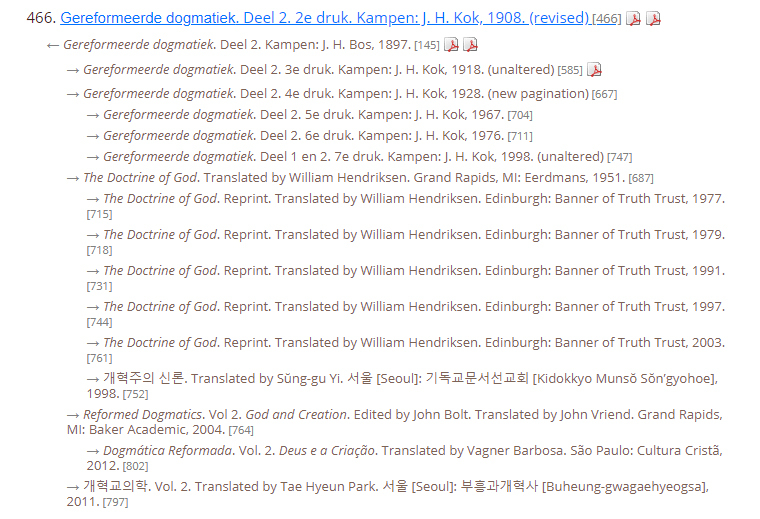 Hendriksen’s translation served also as a basis for the first Korean translation published in 1998. Hence this translation is also displayed under Hendriksen’s translation and with left indent. The next point is John Bolt’s edition. This edition was also the basis for the Brazilian translation. Hence the Brazilian translation is displayed under John Bolt’s edition and with left indent. Finally, Tae Hyeun Park prepared a new Korean translation based on the Dutch second edition. Therefore, it is displayed in the way which indicates that this translation directly “derives” from the Dutch second edition. Clicking on any of these subitems brings the user to this item as a main item. Bibliographical items can be filtered and arranged according to different filters, which can be found in the left menu. The first filter, "All by year", shows all bibliographical items in the chronological order. "All by format" also displays all items, but based on the format (book; book section; journal article; sermon etc). The next filters allow the user to view bibliographical items of a certain format. Filter "In English" displays bibliographical items in English, while filter "In other languages" displays all non-English and non-Dutch items. The last filter displays bibliographical items that are available in PDF or HTML format. Each bibliographical item has a unique ID. It is indicated in square brackets. Unique IDs are fixed. They can always be used in other sources for referring to this bibliography. The main goal of the Sources project is to present neo-Calvinist resources digitally in a convenient way. Many bibliographical items, therefore, refer to resources themselves in PDF and/or HTML. Links to PDF files appear at the end of bibliographical lines as a PDF icon. If several PDF scans were found, the bibliographical item contains links to all of them. Having several PDF files of one and the same edition may be helpful if some pages in a file were omitted or scanned in bad quality. PDFs of Bavinck’s articles published in De Bazuin include not only the respective article, but the entire issue of the newspaper. Apart from PDF scans, the bibliography provides HTML versions of many resources. 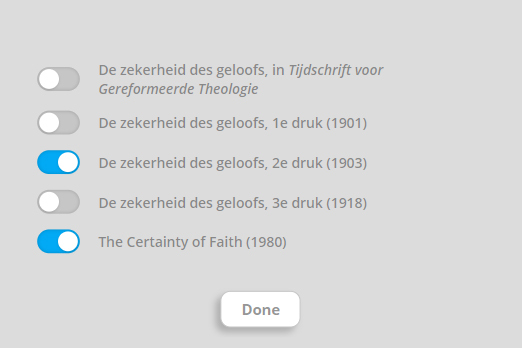 Additional possibilities provided by HTML versions are discussed below using primarily different editions of Bavinck’s book De Zekerheid des geloofs (Certainty of Faith). It is available here. By default, two editions appear: the second Dutch edition (1903) and the English translation (1980). Since the two “default” editions are displayed in parallel columns, the user can easily notice the differences: for example, the English edition does not contain the Foreword. Furthermore, the English translator omitted a paragraph where Bavinck cites Dutch poets – P. A. de Génestet and I. da Costa. On the other hand, the English edition contains subtitles that were not included in the Dutch edition. By clicking on button “Choose versions” the user can choose other editions of the current resource. It is possible to choose as many as editions as one wishes, but choosing too many columns makes it difficult to read the text in many columns. Almost all HTML resources on the site contain page numbers. They can be found between vertical bars (“|”) in the text. Page numbers are always placed at the top – regardless of the actual place in the publication itself. Therefore, in order to find the correct page number for a certain text, one must always look above rather than below it. Not all resources with page numbers, however, have files with scans. This difference is reflected in color: if scans are available, the page number is in red; if they are not available, it is in maroon. Correspondingly, clicking only on a “red” number, the user will see the corresponding scan. After opening any scan, the user can also see the title of the book (the same as in bibliography, but with the name of the author added), page number, and the scanned page itself. Users can move between scans using arrows. The scan page can be closed by clicking on the cross in top right corner or by pressing ESC. Once the first item of menu is chosen, the script copies the selected text into clipboard, and the user can paste it in a text editor or in another program. Choosing the second item of menu leads to the same results, but in addition to the selected text, the page number is copied into clipboard. The third item of menu, in addition to the selected text and the page number, copies also full bibliographical information into clipboard. 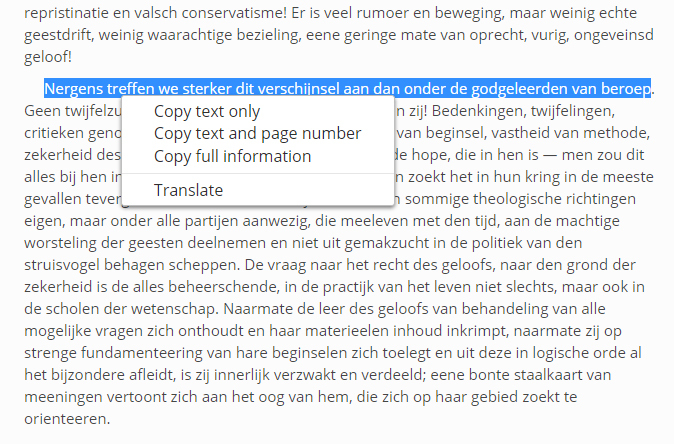 When non-Dutch users work with Dutch texts on our site, they obviously find words and phrases they do not understand. It is also possible that when working with Dutch and English versions in parallel columns, they may want to understand the Dutch original more literally. For these purposes, the site uses the API function provided by Google. After selecting any piece of text (a word, phrase, sentence, or paragraph) and right clicking, the user sees the aforementioned menu and can choose the item "Translation". A translation provided by Google appears then in a small window. If an English text is selected, the user will get a Dutch translation. In the selected text is in Dutch, German, Latin, or other languages, the user will get an English translation. Many texts on the site contain footnotes. The work with footnotes is organized in a convenient and easy-to-use manner. When the user moves a mouse over a footnote number, the content of this footnote appears in a grey popup window. Clicking on a footnote number brings the user to footnotes at the bottom of the page. After clicking on a footnote number in the list of foonotes, the user gets back to the main text.